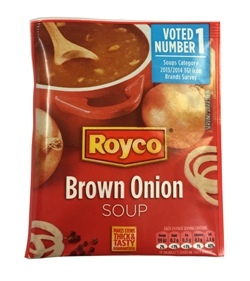 Royco Brown Onion soup is a stock ingredient in the kitchen of any South African household. These handy sachets are a great addition to all kinds of family recipes, like to thicken gravies or enhance flavour in stews or dips, or just for savouring on their own in delicious soup form. Starch (Corn, Wheat), Salt, Irradiated onions (3%), Flavourings (contains Soy), Hydrolysed Vegetable Protein (contains Soy), Colour, Palm Oil, Sugar, Spices, Irradiated Garlic, Food Acid (E330). This soup is wonderful used as a dip when mixed with sour cream.